Some of the most notable clashes between North Korean and South Korean forces in recent years. 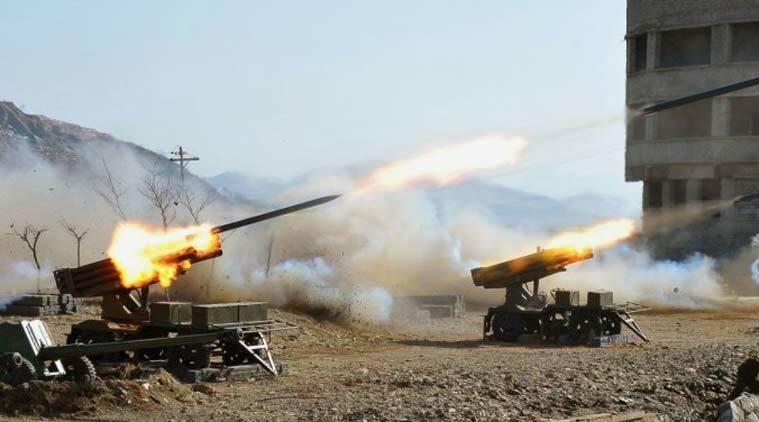 Aug. 20, 2015: South Korea fires dozens of artillery rounds across the border, saying North Korea had fired first to back up a threat to attack loudspeakers broadcasting anti-Pyongyang propaganda. North Korea says the South Korean shells caused no injuries, but denies firing and responds with fury. The North later announces its frontline troops are in a “quasi-state of war” and orders them to prepare for battle. Oct. 10, 2014: North and South Korea trade machine-gun and rifle fire about two hours after South Korean activists release anti-Pyongyang propaganda balloons across the border. Another exchange of gunfire comes nine days later. There are no reports of damages or injuries in either incident. Aug. 10, 2011: South Korea fires several shells in what it says are two artillery exchanges with the North, which denies Seoul’s claim that it fired first. No one is hurt. Nov. 23, 2010: North Korea bombards the front-line South Korean island of Yeonpyeong, killing four South Koreans, two of them civilians, in the first attack on a civilian area since the Korean War. The North said it was responding to South Korean artillery exercises held earlier. March 26, 2010: The South Korean warship Cheonan sinks near the western sea border; 46 sailors are killed and 58 rescued. Pyongyang continues to deny responsibility, though an international team of investigators concluded that a North Korean submarine fired a torpedo that tore the ship in two. Nov. 10, 2009: A North Korean ship is heavily damaged near the western sea border in a two-minute skirmish with a South Korean ship that was only lightly damaged. South Korean officials say a North Korean officer was killed and three other sailors wounded, while the South suffered no casualties. June 29, 2002: The North Korean navy sinks a South Korean patrol boat in a clash along the contested western sea border. Six South Korean sailors were killed, the North acknowledged an unspecified number of casualties and each side accused the other of triggering the 21-minute gunbattle. June 15, 1999: In the first naval skirmish between the two Koreas since the Korean War, a gunbattle breaks out when South Korean navy ships attempt to bump and push North Korean patrol boats back to their own waters. About 30 North Korean sailors were believed to have died when one of their torpedo boats was hit and sunk, while South Korean sailors suffered only minor wounds.